Joined University of Manchester Library in 1998 and have worked in customer services, inter-library loans and then the Research and Learning Support department as a subject librarian and faculty team manager. Currently responsible for managing the Library’s Teaching and Learning team in the delivery of key service’s to support students and staff at the University of Manchester. I am also Project Manager for the Books Right Here Right Now project which is taking a coordinated strategic approach to the problem of meeting student expectations in relation to library provision of core text books. Books Right Here Right Now is a strategic project to radically change core text provision at the University of Manchester. In order to investigate new models for electronic textbook delivery, the project team are running a series of e-textbook pilots, providing textbooks directly to our students via the virtual learning environment. This paper focuses on how usage data and the views of our students and academic staff are underpinning the project in terms of acquisition models, negotiations with publishers and providing a new product to our students. Having detailed the project findings, the article concludes with the authors’ thoughts on the changing environment of the e-textbook market and the various issues within the existing models of e-textbook provision, giving recommendations as to how academic libraries and publishers can help to shape a sustainable model for the UK. At the University of Manchester, one of the main challenges we face with regard to resource provision is ensuring that all students across a wide and diverse range of courses are able to access their core texts via the Library. Traditional just-in-case acquisition models are inflexible, outdated and largely unsuccessful in providing the majority of students with access to the books that they are required to read for their studies.1, 2 Purchasing a set number of print copies for items on reading lists and using e-book aggregators with unwieldy user platforms and restricted user access are not effective systems.3, 4, 5 Furthermore, publishers continue to focus their academic textbook sales effort on lecturers and departments and this has led to an inconsistent approach across the University. Ensuring that students have equitable access to recommended readings has always been a challenge for academic libraries and this is a common concern across the sector that has yet to be resolved. Student feedback indicates that we are still some way from getting it right and analysis of the last four years NSS (National Student Survey) at the University of Manchester showed that in particular, students reported a desire for improved access to library books. The University of Manchester Library launched the Books Right Here Right Now (BRHRN) project in order to provide a strategic solution to these issues. The project seeks to improve the student experience at Manchester by investigating student reading behaviour and implementing innovative models for providing textbooks via the Library. In order to achieve this, the Library must be adaptable and adopt radical new ways of facilitating access to material. We need to move to a demand-driven model of acquisition, looking to purchase or obtain content at point of need and targeted at particular student cohorts. With the increasing complexity of purchase models on offer, there is a heightened need for expertise in negotiations with publishers and for a central point of co-ordination in order to secure the best deals. We also need to apply a more consistent approach to textbook delivery in order to ensure an equitable student experience. We believe that the Library is best placed to take this role and hope to achieve this through the BRHRN project. Whilst we are investigating new e-textbook acquisition and delivery models to better meet the expectations of our students and teaching colleagues, we are also trying to negotiate better deals with publishers by channelling the purchase of e-textbooks across the institution through the Library. This means we can increase the volume of purchases and get better value for money by taking advantage of the resulting economies of scale. In the academic year 2014/15 the BRHRN project rolled out a series of e-textbook pilots which provided 4,563 Manchester students across 12 different Schools with a digital copy of one of their core textbooks: this was funded by the Library from its existing budget. All of the e-textbooks were delivered seamlessly via the virtual learning environment (VLE) using the VitalSource platform. Each student was given 12 months of online access and, in most cases, access to a downloaded copy of the textbook in perpetuity. Students and lecturers were able to sync content across up to four devices and enjoy a variety of interactive features including word search and the ability to make notes and highlights which can be shared. The project has continued into 2015/16 and we have secured funding for 2016/17 allowing us to deliver a third year of pilots. Running pilots over several academic years will allow us to examine three years of usage analytics, evaluate different models and investigate student reading behaviour and their experiences and views on using the e-textbooks. The purpose of the pilots is to test new e-textbook models and their functionality in order to find out how our students feel about using them compared to traditional library e-textbooks or print textbooks. Our academics often tell us that students do not read the texts assigned to them, so we want to see whether providing each student with their own copy of an easily accessible e-textbook encourages them to read more. We also want to know whether our lecturers value them. Does having an e-textbook embedded in the VLE ensure that the books can be better integrated into teaching? The project does not end when the students are given their textbooks, as we want to know whether they used the books and more importantly, if they valued them. For Manchester, providing students with copies of their core textbooks is not about recruitment, so it is vital for us to be able to closely examine usage data and gather user feedback in order to evaluate the success of the pilots. We have amassed a lot of usage data from VitalSource and although it has been time consuming to manipulate the data into a format that we can evaluate, it has enabled us to really understand how the titles are being used. Not only can we see how many of the titles have been accessed, but also the extent and frequency of this usage. We can also assess the degree to which students are engaging with interactive features such as highlighting and note-taking. Looking at usage of the e-textbooks, we found that 74% (3377/4563) of the combined cohort used the e-textbook at least once (i.e. redeemed their copy). At Faculty level we saw a wide variation in usage for titles both across and within Faculties (see Figure 1). Humanities texts had the widest range of usage because the Faculty is large and complex, so we may need to adopt a different approach in terms of e-textbook provision in this area. 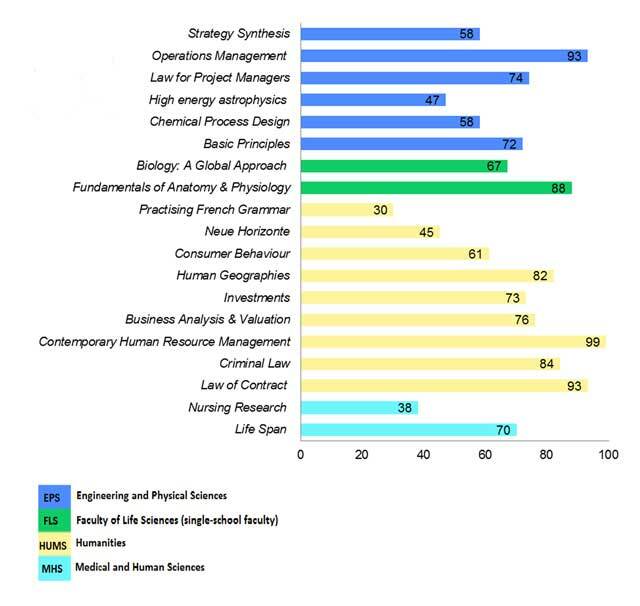 Whereas Law and the Manchester Business School (MBS) within the Humanities Faculty have core texts, many courses (e.g. within the School of Arts, Languages and Cultures) do not. Running pilots across such a range of disciplines will enable us to make recommendations on what will work for each School. At School level, the Law titles had the highest average use (93%, 84%), followed closely by MBS (99%, 76%, 73%), Life Sciences (88%, 67%), Materials (93%, 58%), and Environment, Education and Development (82%, 61%). When we drilled further into the usage statistics to identify the number of visits to titles, we found that 2,155 students used the e-textbook on more than one occasion and 1,222 made only one visit to the title. This means that 47% visited the title on multiple occasions, 27% only used the e-textbook once and 26% did not use the e-textbook at all. Our statistics show that the interactive features were not heavily used across the pilots (Law and MBS students being the exception). Not being able to make highlights and annotations comes up repeatedly as a reason why students do not like traditional library e-textbooks, so we were surprised that the usage of these features during the pilots was so low. The ability to download to multiple devices and read offline was a real selling point for us, but for the first few months of the pilot the vast majority of students (94%) were only accessing the e-textbooks online (via the VitalSource platform). For most of the pilots we negotiated online access for 12 months but access to downloaded content in perpetuity, so the low level of downloads was a major concern. Discussions with VitalSource led us to believe that the students were not downloading the e-textbooks because they were able to access them so seamlessly via the VLE that they did not perceive the need to do so. After the first set of usage figures was received, our academic engagement librarians went back into lectures and reiterated the importance of downloading. 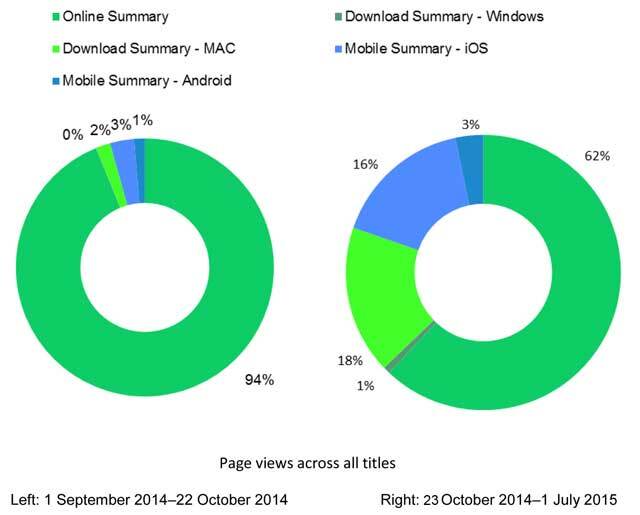 As shown in Figure 2, the figures for 23 October 2014 onwards showed a clear increase in downloading. We have provided more training and information on downloading and using the e-textbooks this year in the hope that we will see an even bigger increase. In order to contextualize some of the usage data, we developed an online survey which was sent out to all students who participated in the e-textbook pilots. Of 4,480 students across 23 modules, 326 (7.28%) responded. Assuming a normal distribution, this gives us a 90% confidence level in the accuracy of the sample, with a +/-4.39% margin of error. The response data was then supplemented by focus group feedback from 22 participants drawn from all faculties. The survey and focus groups concentrated on student awareness and usage, and comparisons of qualities and functionality across print and electronic formats. Students were asked about their awareness of the ability to access their own copy of the core textbook via the VLE. Overall, 95.7% of students said they were aware it was available. Of the students who were aware of their core text being available electronically, 88% said that they read the e-textbook. This is slightly higher than the analytics data shows across all pilots, but we would expect those students who responded to the survey to be more engaged. What we cannot tell from this answer is how many times they looked at the book, which is why it is important to have both the analytics data and the feedback from students. Those who said that they did not read the e-textbook stated that this was because they could not access it, they did not know they had it, or they preferred print. We fed this back into the plan for the 2015/16 pilots in order to ensure that we publicized the e-textbooks more and provided extra guidance on how to access the e-textbooks. In order to investigate whether or not providing students with their own individual copy of the text had any effect on their reading habits, we asked whether having access to the e-textbook made them more likely to do the reading for their seminar. Overall, the majority of students (77%) said yes, it did. This finding is really positive for us, as one of the drivers for running the pilots was to see if providing e-textbooks in this way would encourage students to read more. During the focus groups, all participants agreed that despite having a preference for print, in that they enjoy interacting with it more as a format, the ability to get access to a copy of a core text – regardless of format – overrides that preference. 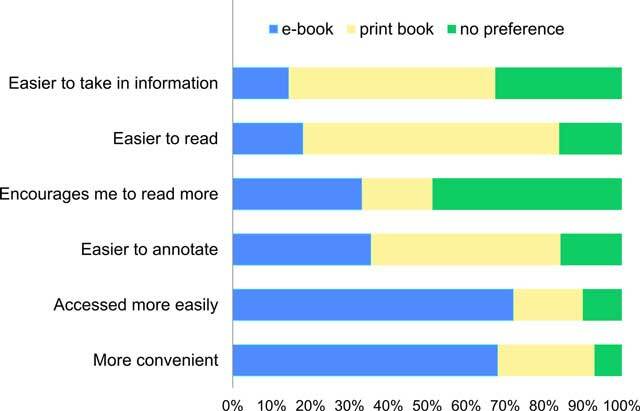 When asked about which e-textbook features they used, the majority of the respondents stated that they did not make use of the extra features. However, word search was relatively popular. The results are consistent with the analytics and the focus group discussions which showed they really liked word search but not highlighting and annotating as they felt it did not adequately mirror the experience of doing this in a print book. Further examination of this during the focus groups showed a general lack of awareness of the e-textbook features and functionality. Despite the fact that introductory overviews had been given to most students at the start of their modules (by academic engagement librarians, publisher representatives or lecturers), many had forgotten this training by the time they began interacting with the e-textbook. When asked about printing, only 13% of students said that they printed pages out from their e-textbook, which is much lower than we expected. All of the 19 lecturers involved in the pilots were interviewed and overall the feedback was very positive. In general, they felt the e-textbook pilots dealt with the issue of availability of texts at point of need and that this led to reduced anxiety and stress. They also reported a reduction in queries on resource provision and found it easier to set core readings and assignments around the textbook. Our efforts to get the e-textbook pilots ready in time for the start of semester one in 2014/15 went right down to the wire. This lack of lead-in time contributed to an underuse of enhanced features, such as highlighting and sharing, by some academics. However, lecturers that did use them valued the opportunity to comment on sections of text and share this with their students. Lecturers commented that they would like to embed the e-textbooks more effectively into their teaching in the future and would like support on how to do this. There were also some worries about the future sustainability of providing e-textbooks in this way as our academics are well aware of the costs involved and had concerns about how we could afford to widen the programme and ensure an equitable offer for all our students. We are just coming to the end of our second year of e-textbook pilots, where we worked with ten different publishers to provide access to a digital copy of a core textbook to 10,000 students. The project team are currently in the process of analysing the engagement data and the staff and student feedback for 2015/16. Some preliminary analysis shows that across all titles, the level of usage is already up on last year and that single-visit usage continues to be significant. The use of highlighting is still fairly low, with negligible takeup of note-taking functionality; law and business students continue to be the exception. From initial concept through to reality, the e-textbook pilots proved to be a significant learning experience for the BRHRN project team. Simply identifying the titles for inclusion in the pilots was far more complex than anticipated. At Manchester there is no central point of truth for us to obtain definitive information on core texts, so we had to go out to each department and ask them for this information (with a mixed level of response). Once we had the title information, storing the details and managing all the data associated with each title was, and continues to be, problematic. We cannot store the information in our library management system (LMS) or our reading list system because neither can adequately handle all the required fields and data. In terms of gaining access to the pilot titles, there was initial reluctance from some publishers to adopt our purchasing models, although most publishers came on board by year two. The problems did not stop once titles had been agreed as there were issues in identifying and supplying the correct edition, ensuring that all rights had been secured (the digital rights to over 200 images for one title had not been secured) and ensuring access for all the lecturers concerned. Resolving the technical requirements with regard to enabling the VitalSource building block within our VLE took considerably longer than we initially estimated. It took over a year to progress through the various staging and testing environments necessary to implement the building block. The process was so protracted that we only managed to get everything sorted on the day before teaching commenced. Finally, the investment of staff time on this project has been considerable, with a conservative estimate of three FTE posts for each academic year. This investment will require more precise calculation when we are defining the potential costs of moving to a university-wide model. The Library will fund another year of e-textbook pilots in 2016/17 and in the meantime we are continuing to evaluate the level of engagement of our students (via analytics, surveys and focus groups) and our staff (through detailed interviews with the academics concerned) with the current pilots. Although we firmly believe that this model of core text provision (one text for each student within a cohort) will become more prevalent in the years ahead, we are also convinced that further work is needed with regard to the current pricing formula. We operate two pricing models for the e-textbook pilots: usage-based and single payment. For the former, we pay for 50% of the cohort upfront and then make subsequent payments for any usage in excess of this figure. We pay the same price per student regardless of levels of usage. The main advantage in this model is that we only pay for what we use. The disadvantages include higher administration costs (in monitoring usage and arranging multiple payments throughout the year) and budgetary uncertainty. For single-payment models, the advantages are budgetary certainty and lower administration costs. The main disadvantage is the difficulty in reaching a pricing model that is acceptable to both sides. We are happy to utilize both models for 2016/17 but would again require significant reductions from the Digital List Price (DLP) for these models to be sustainable. Although we only operate two pricing models, the arrangement with each publisher is slightly different and, in reality, we essentially operate ten different pricing schemes. The absence of a UK pricing model for e-textbooks causes considerable duplication of effort in our negotiations with publishers, a duplication that is also experienced at other institutions rolling out e-textbook access of this kind. We will therefore continue to contribute to Jisc efforts aimed at developing an e-textbook framework. Earlier this year we held a series of in-depth interviews with seven publishers and one aggregator in a bid to achieve greater clarity about the environment publishers are working in, to inform future negotiations around e-textbook acquisition and to develop a sustainable and mutually beneficial model for future supply. These discussions, based on a template of 21 key questions, enabled us to identify our common objective – improving student experience by means of greater engagement with core content – and helped the Library to consolidate its thinking in terms of future contracts. Having provided consistent evidence to refute the notion that free e-textbook provision will automatically guarantee 100% take-up by students, we are now focusing on the issue of meaningful usage. If, having focused our efforts on trying to drive usage (by securing academics who were committed to the e-textbook pilots and running student focus groups, etc. ), we still see a significant level of single-visit usage, we would like to see this recognized in a further reduction from the DLP. We would also like to see greater clarity in terms of the relationship between the constituent parts of the acquisition formula – recommended retail price (RRP), DLP, aggregator mark-up, etc. and, in the future, a move towards pricing that is not based on the print model. We are seeing a downward trend in print sales in the sector.10, 11 Direct-to-student sales are diminishing12 for a number of reasons, including initiatives (such as Manchester’s ‘Textbook Rescue’) that encourage students to donate textbooks to their peers, the growth in the second-hand market, and the illegal downloading or sharing of content. If libraries start to adopt the e-textbook model as one of their core purchasing models, we can offer publishers a share of a much larger market, a market that can be secured if publishers significantly reduce their unit margins. As a guiding philosophy, we think this can contribute to a viable, sustainable solution to e-textbook provision. What next for the BRHRN project? We have some major milestones in the months ahead. A schedule for moving from library-funded e-textbook provision to university-funded provision will be decided in the next calendar year. Alongside the work on the e-textbook pilots, we have also carried out a consultation with our academic staff to better understand workflows around reading lists. The outputs of all this work will enable us to develop a new purchasing policy for reading-list items and inform a recommended reading strategy for the University. The purpose of the reading strategy is to ensure a coherent institutional approach to the provision of reading-list materials and to enable the Library to meet student information resource needs. Sharp, S and Thompson, S (2010). ‘Just in case’ vs.‘Just in time’: e-book purchasing models. Serials 23(3): 201–206, DOI: https://doi.org/10.1629/23201 (accessed 9 June 2016). Howard, J (2010). Reader Choice, Not Vendor Influence, Reshapes Library Collections. Chronicle of Higher Education 57(12): A11–A12. Vasileiou, M, Hartley, R and Rowley, J (2012). Choosing e-books: a perspective from academic libraries In: Online Information Review 36(1): 21–39, DOI: https://doi.org/10.1108/14684521211206944 (accessed 8 June 2016). Frame, R M (2014). ‘A comparison of use between e-books acquired in bulk packages, individual titles, and user requested titles at a health sciences library’, UNC Chapel Hill Theses. University of North Carolina at Chapel Hill, NC, pp. 1–1. https://cdr.lib.unc.edu/indexablecontent/uuid:fab1cf93-c472-4cef-8cac-9fb15f67841f (accessed 10 June 2016). Goedeken, A and Lawson, K (2015). The Past, Present, and Future of Demand-Driven Acquisitions in Academic Libraries, College & Research Libraries. 76(2): 205–22, DOI: https://doi.org/10.5860/crl.76.2.205 (accessed 8 June 2016). McKiel, A (2011). 2011 Global Student E-book Survey. Proceedings of the Charleston Library Conference>. : 143–154. http://dx.doi.org/10.5703/1288284314890 (accessed 10 June 2016). Cassidy, E, Martinez, M and Shen, L (2012). Not in love, or not in the know? Graduate student and faculty use (and non-use) of e-books. Journal of Academic Librarianship 38(6): 326–332, DOI: https://doi.org/10.1016/j.acalib.2012.08.005 (accessed 9 June). OCLC (2014). At a Tipping Point: Education, Learning and Libraries. http://www.oclc.org/content/dam/oclc/reports/tipping-point/215133-tipping-point.pdf (accessed 10 June 2016). Menzies, K (2015). An evaluation of student perceptions and use of e-books In: Report for the Books Right Here Right Now e-book pilots 2014–15. The University of Manchester Library. Unpublished internal document. Williams, C (2015). Pearson woes deepen over UK ebook price row. The Telegraph, Dec 13 2015 http://www.telegraph.co.uk/finance/newsbysector/mediatechnologyandtelecoms/media/12048339/Pearson-woes-deepen-over-UK-ebook-price-row.html (accessed 10 June 2016). Barclay, D (2015). Academic print books are dying. What’s the future?. The Conversation, Nov 10 2015 http://theconversation.com/academic-print-books-are-dying-whats-the-future-46248 (accessed 9 June 2016). Mitchell, J A (2014). Tough Lesson for College Textbook Publishers. The Wall Street Journal, Aug 27 2014 http://www.wsj.com/articles/a-tough-lesson-for-college-textbook-publishers-1409182139 (accessed 9 June 2016). Books Right Here Right Now blog. https://blog.brhrn.library.manchester.ac.uk/ (accessed 15 June 2016).